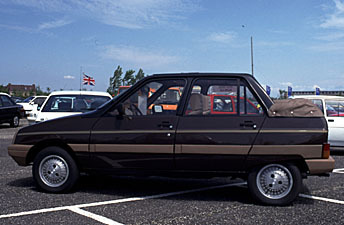 The Citroën Visa was launched in the late summer of 1978 as the successor of the Citroën Ami 8. The Ami, which once started life as the Ami 6, was meant to be the successor of the 2CV. Although the car sold very well in the sixties, particularly in France, it did not succeed in superseding the old "deuche". In the end, the 2CV outlived the Ami for almost twelve years. The Visa was based on the Peugeot 104. The coachwork was nevertheless notably different, and the Visa was, in contrast with the Peugeot, also available with an air cooled twin cylinder engine. Especially this motorisation, and the fact that the Visa succeeded the Ami, which was known as a "luxury-deuche", resulted in a similar reputation for the Visa. The remarkable exterior of particularly the first model series (marked by a "pig snout") contributed to this expression. 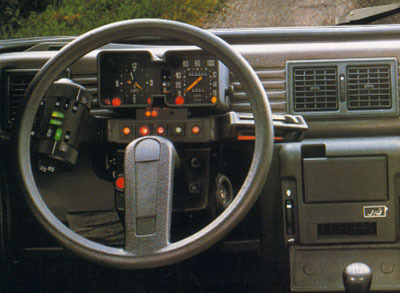 The design of the dashboard was uncommon as well: instead of the usual handles at the steering column, the Visa was furnished with "satellites", referred to by Visa lovers as the "beer can" and the "cheese slicer". The first series were, mostly due to their radical front end styling, not extremely popular. 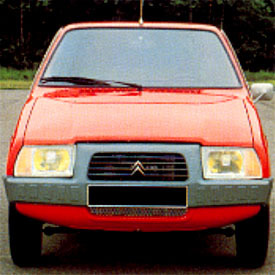 The disappointing sales forced Citroën to develop a quickly restyled version, known as the Visa II, during the model year 1981. In particular the front styling was altered, and the car obtained a more moderate look. Sales boomed immediately. When the dash "satellites" were replaced by more ordinary handles in 1984, the Visa lost even more of its initial character. Nevertheless, the Visa retained it's cute and non-interchangeable overall styling. The Visa II came in various new versions. One of the most interesting derivates was the open top version called Déccapotable. There were numerous sporting derivates. The GTi even touched the 120 mph limit. There were successful 4WD rallye versions as well. Besides that, a Diesel version was launched, which became immensely popular with buyers and press. The C15 van completed the series. 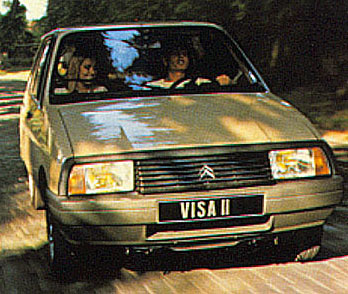 A Visa of the second series (photo by Citroën). The Décapotable was available in few colour schemes. One of them was this not so attractive shade of brown. The Visa was, after several successful years, discontinued in 1988, in favour of the more modern (but less roomy) AX. Values of used Visas sank when the cars became older, and many ended in scrap yards. Today, the Visa starts to become rare. Since the begin of the 21th century, however, the enthousiast's following for the Visa grows. In The Netherlands there are two clubs: the Visa Club Nederland and the Visa Sport Club Nederland. Both clubs organize meetings and try to preserve parts for their cherished cars. 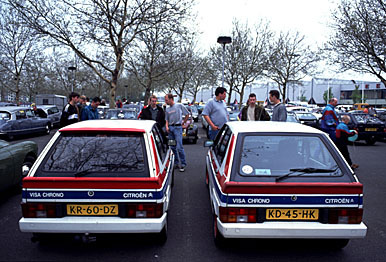 Two sportly Chronos showed up during the annual Citromobile festival in the city of Utrecht, May 4th, 1997. The more sporting versions of the Visa gained some collectors status in the nineties. All photographs © Okke Groot, unless stated otherwise.